^ a b Charles Coulter and Patricia Turner (2000), Encyclopedia of Ancient Deities, Routledge, ISBN 978-0786403172, page 258, Quote: "When Brahma is acknowledged as the supreme god, it was said that Kama sprang from his heart." David Leeming (2005), The Oxford Companion to World Mythology, Oxford University Press, ISBN 978-0195156690, page 54, Quote: "Especially in the Vedanta Hindu philosophy, Brahman is the Absolute. In the Upanishads, Brahman becomes the eternal first cause, present everywhere and nowhere, always and never. Brahman can be incarnated in Brahma, in Vishnu, in Shiva. To put it another way, everything that is, owes its existence to Brahman. 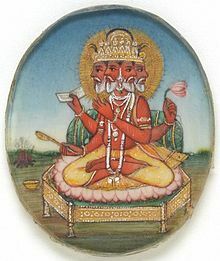 In this sense, Hinduism is ultimately monotheistic or monistic, all gods being aspects of Brahman"; Also see pages 183-184, Quote: "Prajapati, himself the source of creator god Brahma – in a sense, a personification of Brahman (...) Moksha, the connection between the transcendental absolute Brahman and the inner absolute Atman." ^ Gopal, Madan (1990). K.S. Gautam. ed. India through the ages. Publication Division, Ministry of Information and Broadcasting, Government of India. p. 79. ^ Bryant, ed. by Edwin F. (2007). Krishna : a sourcebook. New York: Oxford University Press. p. 7. ISBN 978-0-19-514891-6. ^ Sutton, Nicholas (2000). Religious doctrines in the Mahābhārata (1st ed.). Delhi: Motilal Banarsidass Publishers. pp. 182. ISBN 81-208-1700-1. ^ Bryant, ed. by Edwin F. (2007). Krishna : a sourcebook. New York: Oxford University Press. p. 18. ISBN 978-0-19-514891-6. ^ Frazier, Jessica (2011). The Continuum companion to Hindu studies. London: Continuum. pp. 72. ISBN 978-0-8264-9966-0. ^ Robert E. Buswell Jr.; Donald S. Lopez Jr. (2013). The Princeton Dictionary of Buddhism. Princeton University Press. pp. 141-142. ISBN 978-1-4008-4805-8. https://books.google.com/books?id=DXN2AAAAQBAJ.